Hoodie's like this one are so fun to wear! I was sure to put in a zipper to make it all the more comfortable and easy to wear. 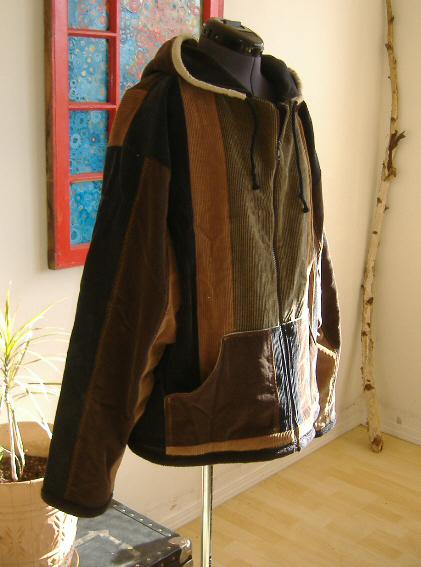 In addition to the zipper, it's got a lot of awesome features: It is fully lined with fleece in the torso and flexible flannel in the arms. 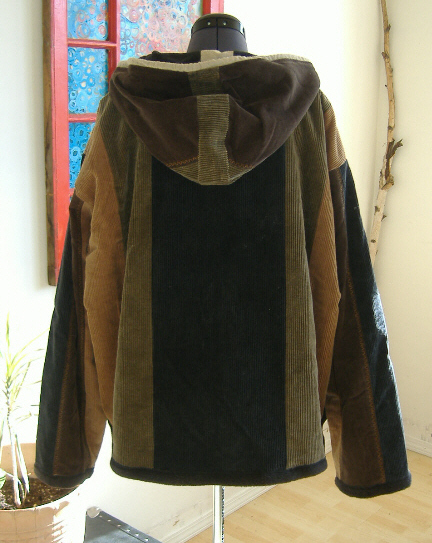 The hood is lined too and it has a flannel drawstring casing to keep out the cold. 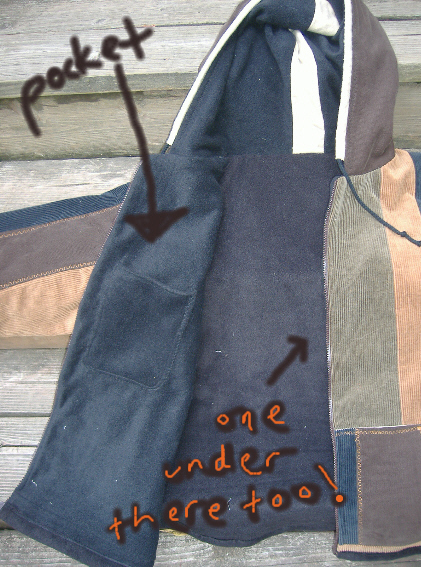 There are 2 pockets in the lining next to the zipper. 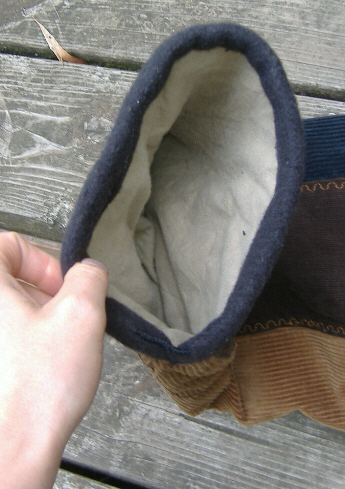 There's also a flannel lined kangaroo-pocket on each side in the front to keep your hands cozy and warm. 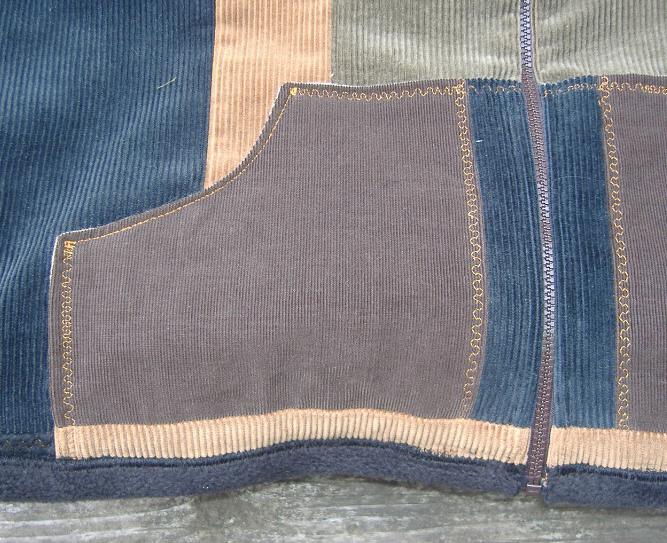 Furthermore, all the seams are pressed flat and a bunch of them (especially those in the arms and on the pockets) have gold-colored top-stitching to keep the hoodie looking amazing and in sturdy, strong condition. The sizing is perfect for someone more stout and fuller in the gut. Compare the measurements listed below to a jacket or another hoodie that you know fits well. The sleeve length can be altered for *free* for the winner before I mail it out the sleeves look long only because the dress form is too small for the hoodie... when the shoulders are filled out the sleeves will come up). 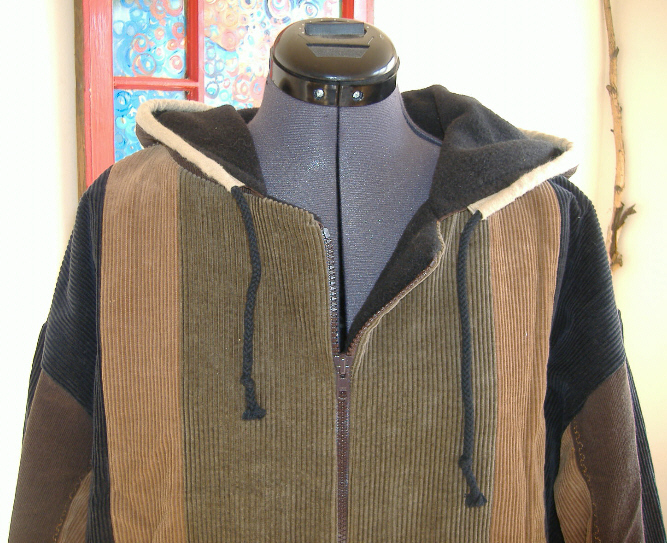 This hoodie is made entirely with recycled corduroy in shades of brown, tan, green and black. The fleece lining is solid black, brand-new and anti-pill (meaning it won't get out of control with those little balls of lint that you find on old sweaters and other types of fleece). The flannel lining is 100% cotton and it's a shade of beige. 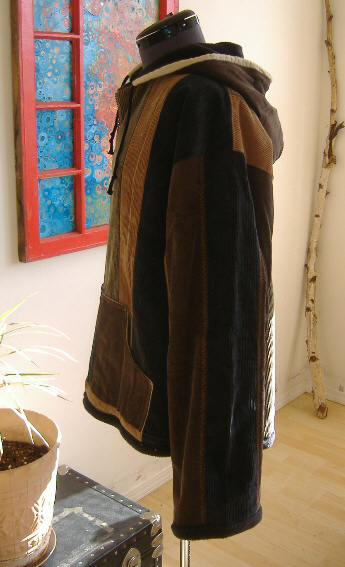 This hoodie's hood fits perfectly with the neck opening and the sleeves fit perfectly with the arm openings. 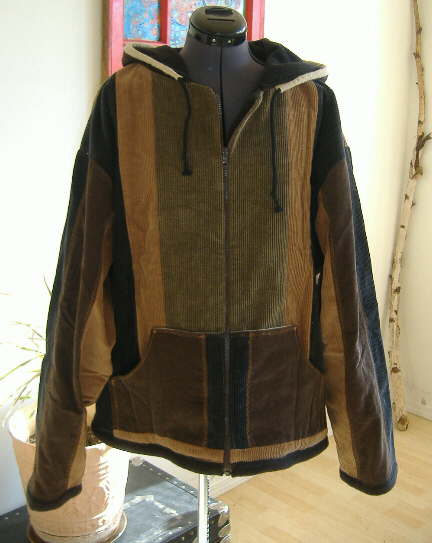 I found an awesome video online and was able to figure out a great way to sew up a hoodie so it would fit comfortable, look awesome, and be fun to make :) All the material used was pre-washed (except the fleece) and all the fabric pieces are over-edged to prevent fraying and all the seams are double-stitched to ensure longevity. The whole hoodie is lined, so you won't see any raw seams, and you'll be kept super warm and comfy no matter where you're at.